Iranian President Hassan Rouhani says an unstable oil market and low prices will be detrimental to both oil exporting countries and consumers. “Instability and the drop in oil prices will not only be detrimental to member countries [of the Organization of the Petroleum Exporting Countries], but will also be inconsistent with the major objective of environment conservation across the world,” Rouhani said in a meeting with OPEC Secretary General Mohammed Barkindo in Tehran on Tuesday. He expressed hope that oil prices would return to a “stable and fair” state through cooperation among OPEC members and their prudence. “Today, we must all pursue a common goal which is having a balanced market and fair and just shares among OPEC member countries,” Press TV quoted the Iranian president as saying. He also declared Iran’s support for any decision to restore stability to the global oil market. 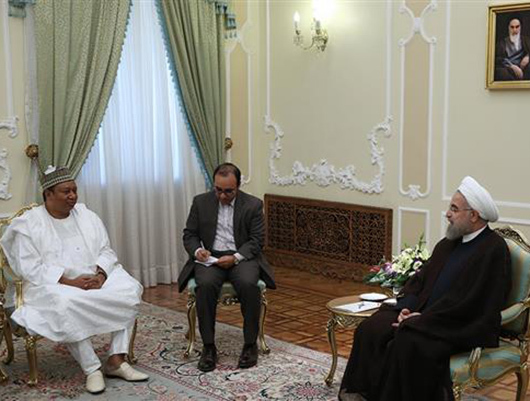 “The Islamic Republic of Iran will support any move in line with market stability and the improvement of oil prices based on justice, fairness and respecting fair shares for oil producing countries,” Rouhani pointed out. Oil-exporting countries have been seeking a deal to cap production levels in an attempt to prevent a further drop in global oil prices, which in recent years saw a fall from a high of 147 dollars a barrel to a low of around 25 dollars. Saudi Arabia, however, has torpedoed plans for a freeze on global production aimed at stabilizing oil markets, arguing that Iran must freeze its output. Tehran, meanwhile, says that it wants to raise production to levels prior to the imposition of the now-removed US-led sanctions over its nuclear energy program. Iranian Minister of Petroleum Bijan Zanganeh said on Tuesday that Iran supports any potential measures aimed at restoring stability to global oil market, adding that most OPEC member states support oil prices between $50 and $60 per barrel. The OPEC chief, for his part, commended Iran’s support for the international body’s independence and growth. Barkindo said oil producing and consuming countries must boost cooperation to settle the existing challenges in the global market, adding that OPEC member states must do their part in solving problems that face the market. He also hailed Iran’s great achievements in the energy sector and said the country has managed to make great progress and take major steps in various fields of economy, particularly in the oil and gas industry, in a short period after the removal of sanctions against Tehran. Iran, which is OPEC’s third largest producer, has been ramping up crude oil output since a nuclear agreement, known as the Joint Comprehensive Plan of Action (JCPOA), between Tehran and the Group 5+1 took effect on January 16, removing obstacles in the way of more crude production.